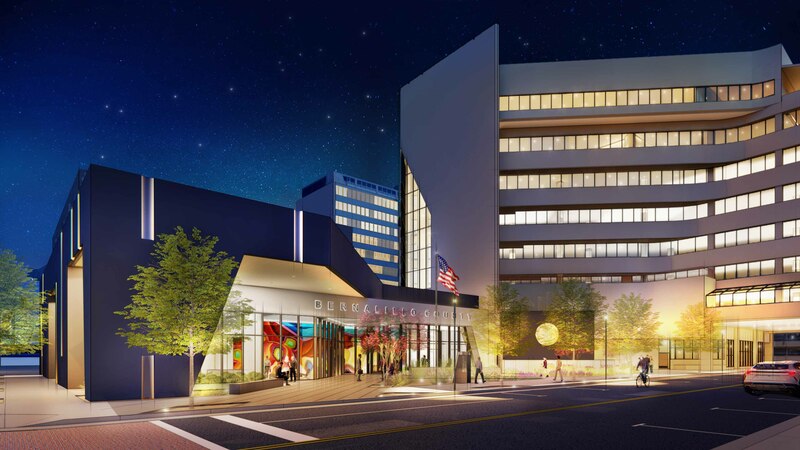 HB Construction is moving forward as the Design-Builder for the new Bernalillo County Government Center, an eight-story renovation in Downtown Albuquerque. The new headquarters will house over 900 County employees and provide a one-stop destination for constituent services. Dekker/Perich/Sabatini Architects will serve as the design lead for the project. Bernalillo County purchased the Alvarado Square Building—formerly PNM headquarters—in May 2017. The facility will undergo a significant renovation, with the adjacent annex removed to make way for a new Commission Chambers. By consolidating from six facilities into a single space, the County will reduce maintenance costs by over $20 million and create greater operational efficiency. At the outset of the competitive selection process, Bernalillo County leadership and staff identified clear project priorities, including security, community interaction, sustainability, and longevity. The HB Construction team submitted a preliminary design and management plan in line with these priorities and other design criteria. A notable feature for the new facility is an accessible customer service interface. Roughly 140,000 constituents visit Bernalillo County annually, seeking a range of services and County personnel. They will now be guided to a one-stop information desk that can quickly route them to their destination. Security will be a major point of emphasis during design, construction, and operation. A single public point of entry will focus security efforts, along with advanced access controls and surveillance. The project team will use collaboration opportunities inherent to Design-Build to fully align design with Bernalillo County’s vision. Departmental staff and leadership will participate, providing insight into employee and constituent needs. Joining the HB Construction team is an integrated group of local contractors and engineers, including Theco Electric, Yearout Mechanical, Bridgers & Paxton consulting engineers, and others.